Noise, Vibration and Harshness (NVH) is the study and modification of noise and vibration characteristics particularly in cars and trucks. 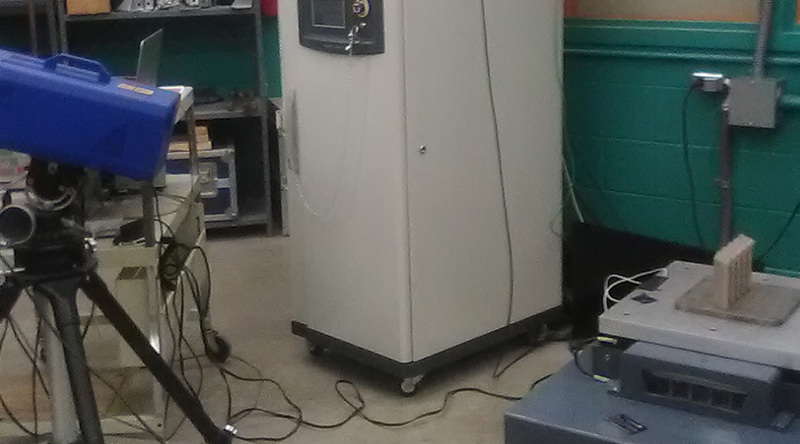 OptoMET Laser Doppler Vibrometry is used in many NVH testing applications within the Automotive Industry. Original Equipment Manufacturers (OEMs) utilize scanning laser vibrometry for measurements on full scale body-in-white vehicles to validate and update Finite Element Models (FEMs). Subsystem and component level testing also enjoys the benefits of LDV. For example, OEMS and suppliers of braking systems routinely use LDVs to address brake squeal issues, verify supplier components meet Frequency Response Function (FRF) design specs and perform production line testing. Even sub-suppliers of automotive electrical components utilize LDV to solve failures on printed circuit boards or other products that arise out of Highly Accelerated Life Cycle (HALT) or Durability Testing. Automotive Suppliers perform a great deal of LDV testing to characterize shim (damping) materials to offer the most effective solution with a particular program’s budget and weight constraints. As Noise, Vibration & Harshness (NVH) targets a passed down to suppliers for OEMs, suppliers are now required to conduct production testing to meet vibration specs. OptoMET Laser Vibrometers are ideal for production QC applications where NVH is now a part of acceptance specifications. OptoMET’s SWIR Laser Vibrometer technology is ideal for automotive brake system and component testing. The distinct advantage of OptoMET’s solution over traditional HeNe based systems is most clearly demonstrated during measurements on the friction surface of rotors on a brake dyno. Back to back testing of SWIR and HeNe vibrometers has proven the inability of HeNe to produce quality data due to excessively high noise levels. These high noise levels mask the resonances engineers seek to investigate. OptoMET’s SWIR technology produces dramatic results in these applications with noise levels 40dB to 50dB below the peak amplitudes of resonances which makes them the clear choice for engineers who wish to characterize rotor dynamics. 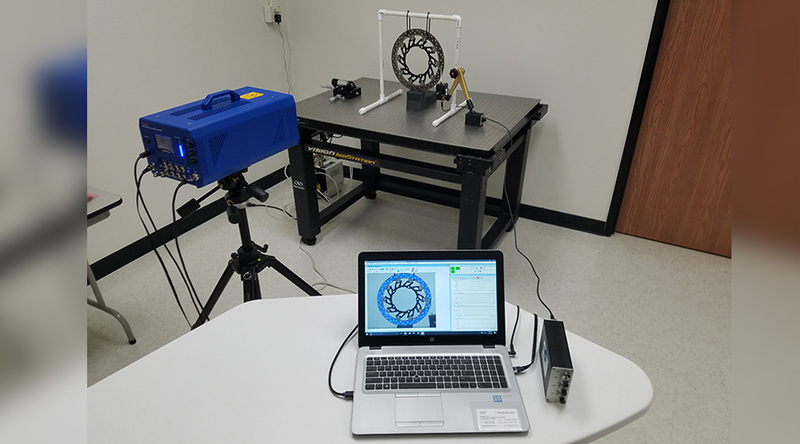 OptoMET’s scanning laser vibrometry can be utilized during dyno testing of brake systems to characterize caliper and rotor behavior. Dental Scaler manufacturers measure vibrations of dental scalers to study correlations between dynamic response and subjective consumer preferences for cleaning performance and feel. 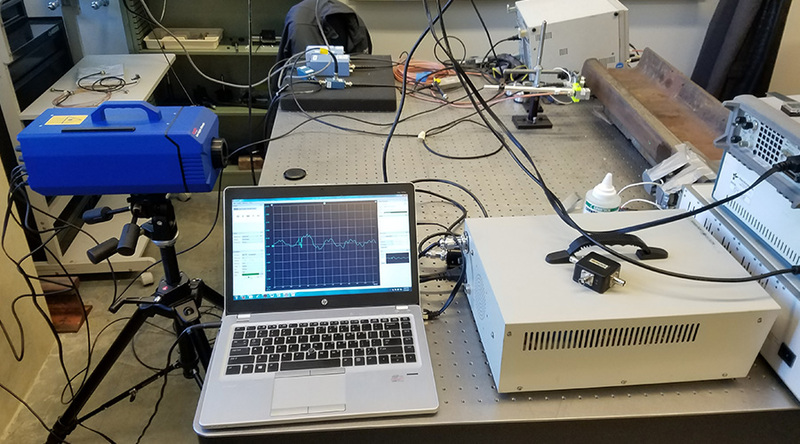 By conducting vibration quality studies, scaler manufacturers seek to understand which vibration parameters in their scalers and competitive scalers relate to high or low practitioner preference. This valuable knowledge allows them to design vibration quality into their devices which meets customers expectations and captures more market share. OptoMET’s SWIR Digital Scanning Laser Doppler Vibrometers are used to characterize these vibrations as devices should not be mass loaded or surface treated during testing to produce the most reliable and accurate data possible. Companies that design and manufacture consumer electronics are in a race to gain market share through superior product performance and a better customer experience. 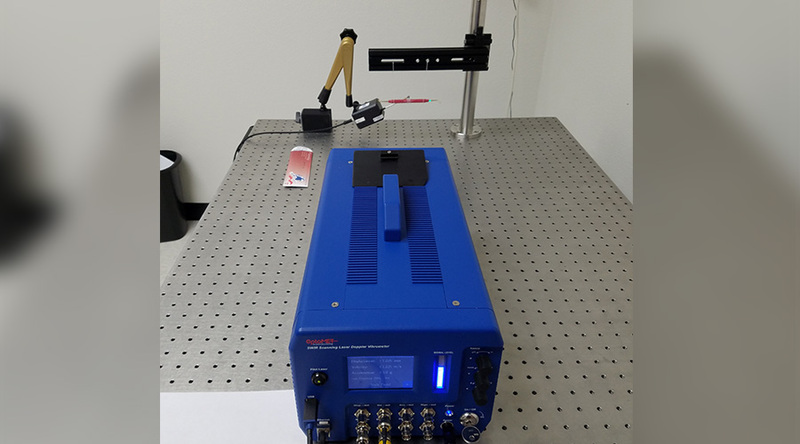 Laser Doppler Vibrometry is an ideal non-contact measurement technique for characterizing vibrations of electric shavers. Manufacturers use this vibration data to optimize the performance and comfort of their shavers. Measurements are made on individual blades and grip areas where the shavers are held. Additionally, manufacturers can investigate how the various battery powers effect the movement on the blades of the skin. These measurements would not be possible without a non-contact technique and offers manufacturers great insight into the operation of their devices which allows them to design more effective and competitive products. Jet engine manufacturers test fan blades to validate physical resonances and damping against analytical model predictions. This is a critical step in product development to ensure blade resonances and engine resonances are not coupled which leads to premature failure. OptoMET’s Laser Doppler Vibrometers are ideal for measuring turbine blades, bladed disks and other engine components for all frequencies of interest with out requiring any surface treatment. OptoMET Scanning Laser Vibrometer measurements can be made to provide customers deflection shapes of blades and which can be analyzed to determine modal properties. Manufacturers of instrument strings study string dynamics to constantly improve designs to achieve better sound quality, durability and consumer preference. In order to prevent mass loading string vibrations must be measured with a non-contact measurement system. The mass loading effects of traditional sensors like accelerometers may change the dynamic response of measurement object. In the case of strings, it is impossible to even attach contact sensors to strings. OptoMET’s SWIR Digital Laser Vibrometers allow string manufacturers to measure vibration levels, resonant frequencies, damping and the effects of material choices when improving their string designs. As more manufacturers implement additive manufacturing (AM) to their production processes, there grows a need to understand and measure defects associated with this technique. By inducing vibration into a part created by AM and measuring it with an OptoMET Scanning Laser Vibrometer, customers learn if changes to the dynamic response of various parts is an indication of internal defects or cracks. This full field analysis is possible with the non-contact nature of Laser Doppler Vibrometry and the extremely high sensitivity possible with the OptoMET SWIR Vibrometer technology. High Magnification Imaging Devices that utilize precision stages for specimen placement often implement feed back control systems to ensure a fixed working distance during scans. Precise control of stage motion is critical for successful scans of biological specimens. Numerous vibration sources can affect the performance of these stages during scans which may cause an error in the reading. In cases of destructive testing, the biological sample cannot be rescanned resulting in costly waste of the sample. Sources of problematic vibrations can be environmental such as the laboratory or internal to the imaging device. Complicating matters is the sensitivity of the imaging process to undesired motion. Engineers create control systems that control stages with nanometer precision. Vibration problems such as these require a non-contact, highly sensitivity vibration measurement system that requires no surface treatment. 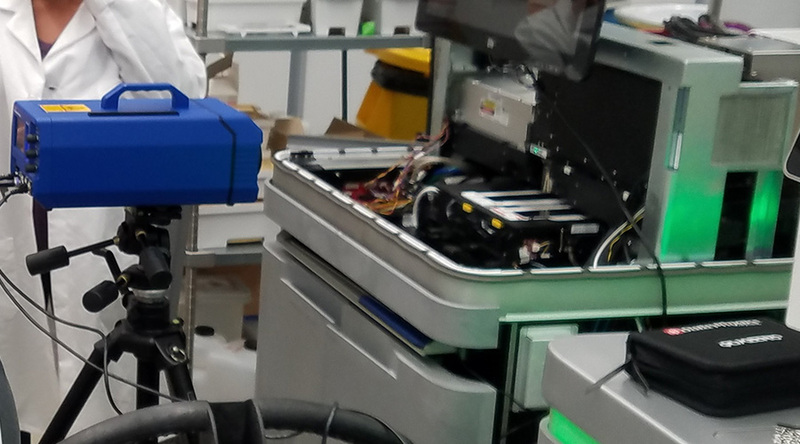 Customers have come to rely on OptoMET’s SWIR Digital Laser Doppler Vibrometers to provide them the most sensitive vibration measurements possible without the need for surface treatment on dark, black, matte or other optically uncooperative surfaces. Using OptoMET’s technology, engineers can qualify vibration levels and design solutions for challenging environments or internal instrument dynamics. Railroad authorities all over the world are interested in improving the efficiency of their rail defect detection systems. This field of structural heath monitoring of railroad tracks is currently limited by the measurement technique which involves a relatively old technology that produces imperfect reliability of defect detection and limited inspection speed. OptoMET Laser Doppler Vibrometry is being evaluated to overcome drawbacks of conventional rail testing. Ultrasonic waves are propagated through the railroad track and interact with a defect. These waves are measured by the OptoMET Laser Doppler Vibrometer, which has exceptional sensitivity and signal strength, which is critical to obtaining data free from noise and drop outs on rusted and optically uncooperative surfaces where surface treatment is not possible. The goal of the research is to develop a reliable defect detection systems that can be operated from regular passenger cars travelling at normal speeds.